The Sailor Moon Official Site has posted some information about the upcoming new episodes of Sailor Moon Crystal. The Infinity story arc will start this Spring. The production staff has been revealed with more details coming during a live event which will be shown on Niconico Wednesday January 27th at 8pm Japan Standard Time, 6am Easter Time, 3am Pacific Time. Sailor Moon Crystal’s new director is Chiaki Kon. She has directed a number of Anime shows I’ve never heard of including Higurashi no Naku Koro ni, Junjo Romantica and Hanasakeru Seishonen. It’s nice to see a woman directing a show that is largely about and for women and girls. Akira Takahashi, who was an animation director for individual episodes of Sailor Moon Crystal, will be taking on the role of character designer. Other staff remain the same. Series writer Yuji Kobayashi returns. 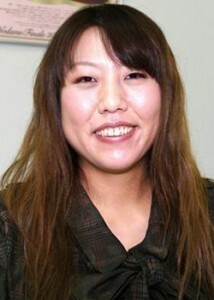 Takashi Kurahashi remains the animation director. Yasuharu Takanashi will continue to do the music. 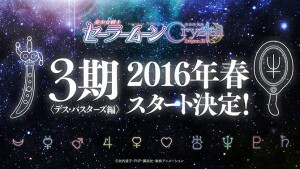 The third arc of Sailor Moon Crystal, called the second season by some and the third season by others, will cover the Infinity story arc of the manga, which is the Sailor Moon S season of the original anime. 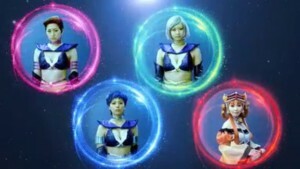 This will introduce us to Sailor Uranus, Neptune and Saturn as well as the Death Busters. The rest of the gang, including Sailor Pluto, will return. 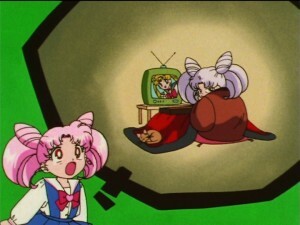 Unlike in the original anime Chibiusa will be present throughout this arc. She didn’t stay in the future for any period of time following the fight against the Black Moon Clan. We previously learned that the new episodes will air on TV in Japan first, though it is unclear how quickly it will be available to stream for international viewers. One way or another, the show will likely be made available either officially or through fansubs within a few days of the original broadcast. You can always count on this site sharing specifics about how to enjoy the show. 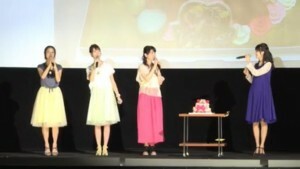 You can check out the stream on the Niconico site starting January 27th at 6am Eastern Time. I’ve watched many of the older streams online but I have been region blocked from viewing more recent ones for not being in Japan. I will do my best to watch the feed or at the very least follow news of the event and share all of the details. As always take all news for what it is. 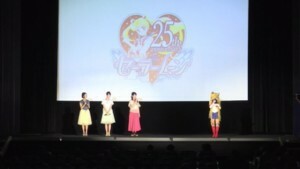 The original release of Sailor Moon Crystal was delayed a number of time before having a firm release date. A very official source is claiming that the show will be available in the Spring but there is always the possibility of further delays. For reference, Spring this year will run from March 20th to June 20th.